Industrial Shelf Brackets - Steampunk Black & Brass Pipe Fittings - 3 Designs! Unique Industrial Steampunk Black & Brass Towel Rail - Made from Pipe Fittings! 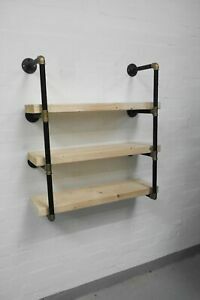 Details about Steampunk Shelf / Shelving / Bookcase - Made From Black & Brass Pipe Fittings!